Annually, the Coca-Cola Scholars Foundation 2016 receives thousands of applications from high school seniors and we review every one carefully. The selection process we have developed ensures that each year we award scholarships to those who are most committed to positive leadership in serving others and to academic excellence. Our application is open! If you are a current high school senior, you may apply here. This initial online application requires you to list your grades, school and community activities, and employment, but no essays or additional materials are required. We review all online submissions and applicants learn by mid-November whether they will become one of the roughly 2,200 Semifinalists. The Semifinalists submit additional materials by late December. Materials include a biographical questionnaire, official transcript, essays, and recommendations. The Program Reading Committee, which includes education professionals and past recipients, reviews Semifinalist applications in early January. Semifinalists learn by late January if they will be one of 250 Regional Finalists. Regional Finalists will receive at minimum a $1,000 educational stipend. Regional Finalists participate in interviews, either in person or via video conference, with the Regional Interview Committee. The Regional Interview Committee is divided into interview teams of three, each team comprised of two program alumni and one Foundation staff member. Depending on the location of the Regional Finalists, their interviews will take place on February 17, 18, 24, or 25. After regional interviews, 150 Regional Finalists will be named Coca-Cola Scholars. Regional Finalists who do not advance will receive a $1,000 educational stipend. 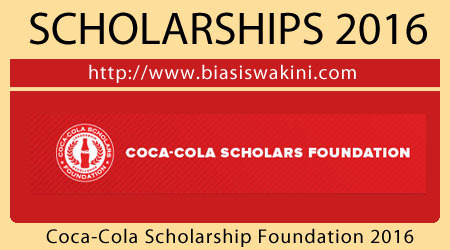 The 150 Coca-Cola Scholars will all be awarded $20,000 in scholarship funds. The 150 Coca-Cola Scholars attend the 2017 Scholars Weekend April 20 – 23, where they meet their peers for a time of inspiration, fun, and camaraderie. Scholars participate in the Leadership Development Institute, an intensive leadership training during Scholars Weekend that challenges the newest class of Coca-Cola Scholars to develop an inside-out leadership philosophy. Want to learn more about what it is like to experience Scholars Weekend? Read about it first hand from 3 of our 2015 Scholars! The Coca-Cola Scholars Weekend marks the beginning of a lifelong connection among new scholarship recipients and the extended family of thousands of Coca-Cola Scholars.